Tide Cafe and Catering can organise your catering requirements and also have available venue hire options for your corporate function, special event or wedding. The event spaces can be customised to your requirements. Our events team can help you with setup options. Our ballroom is the most versatile space where we can seat 70-170 people comfortably. The lobby room is ideal for pre-wedding drinks or an intimate gathering. This space is designed for parties of 10-40 seated. The venue is located at 68 McIlwraith Street, South Townsville, located just off beautiful Palmer Street. With sea breezes and views of the Marina and Maritime parkland, it is the perfect location for your next event. 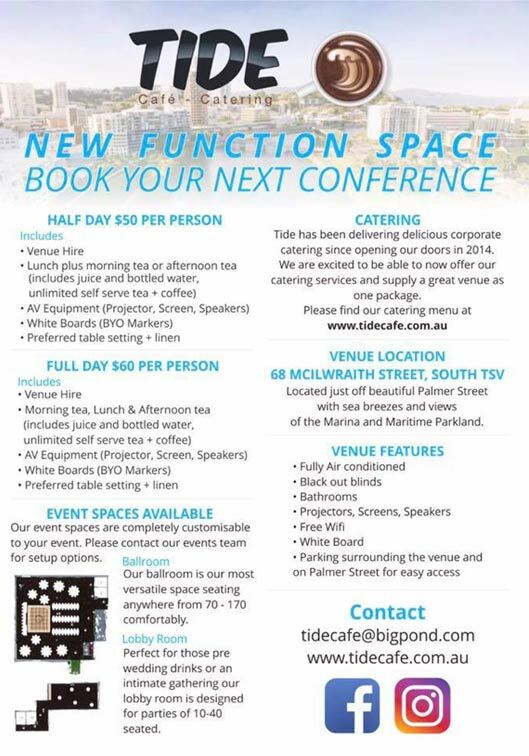 From small meetings to large scale ceremonies and 200+ events, talk to the Tide Cafe team or submit an enquiry online.